40 BEFORE 40: SEASONS GREETINGS! 9. Send out 2014 Christmas cards. 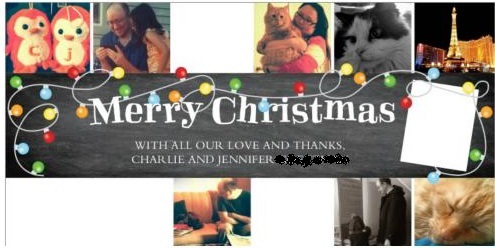 The last time I sent out Christmas cards was the year Charlie and I were married. I should probably send out Christmas cards and update friends and family about our first year in Iowa. With so many options and designs available, I had a hard time choosing the perfect Christmas card but I found a card that offered the perfect way to document our first year in Iowa. When we’re not at home with our always well behaved cats, Charlie and I gambled a little bit in Las Vegas and spent time with my family in the area. I just can’t believe the middle of December is already here and somehow feel like I’m not ready for the holiday magic (although that hasn’t stopped me from consuming a large amount of holiday chocolate). My shopping is complete (and wrapped), and my brand spanking new sewing machine has been busy completing a few projects.